Method of the resistance tomography belongs to the electrical surface methods of geophysics. Resistance tomography is very suitable and effective method for problem solving of the structure of the crust at depths within the first tens of meters. The method was developed in the nineties with the development of computer technology and allows realizing a measurement of selected density of information points according to the objective of the research. 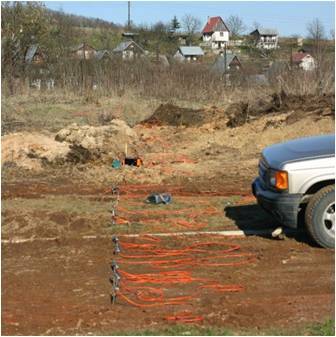 By this method is possible, by using multi-electrode cable in one process, to measure studied profile in several layers, according to the specified depth range, with the chosen density of the step measurement from 1-5 meters. Izoohmic vertical cut made by method of the resistance tomography (multicable) and its geological interpretation. Surface interpretation of the vertical izoohmic cuts for the selected altitude. 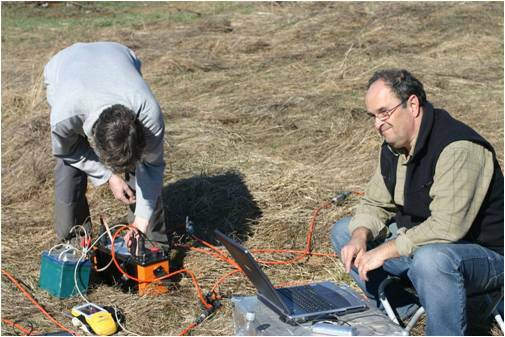 Processing and control of measured data in the terrain. Working with multicable in the terrain.